In our previous article we have shown how to secure EMQ connection with SSL. In that article we’ve used self generated certificate for SSL to secure the connection between broker and clients. Self generated certificates are convenient for test and development. But it is uncool to use such certificates in production, especially when you are publishing your application over the Internet. People may see untruthful certificate warning when using your service. Luckily, we have Let’s Encrypt,one great service from Linux Foundation Collaborative Projects. It can be accessed by anyone without cost or complex procedure. The principle of Let’s Encrypt is that it offers Domain Validation (DV) certificates, but not Organization Validation (OV) or Extended Validation (EV). By only providing DV, Let’s Encrypt is quick and simple, and it also makes automatic (no human intervention) issuing and renewing of certificates possible. The agent has the control to the private key. This is usually done by signed/encrypt a nonce sent from the CA and hanging this signed/encrypted nonce on a URI which starts with the claimed domain. If you are interested to know more about Let’s Encrypt, please click this: How Let’s Encrypt works. As mentioned above, you need an agent installed on the server to generate a RSA key pair and to interact with the Let’s Encrypt CA to request a certificate. Here we will us the certbot. certbot is a ACME client by Electronic Frontier Foundation (EFF), it can request and deploy certificates on your server, an easy to use automatic tool. to obtain an server certificate for EMQ uses only a small part of certbot’s functions. Here we assume that on the server there is no web server running and we will have to run certbot in standalone mode. In standalone mode, certbot works also as a web server and put the response on its uri and for the CA to fetch. The default key length used by certbot is 2048, change it if necessary (--rsa-key-size parameter). certbot may be not included in the linux distribution, taken the ubuntu 16.04 as example, you will need to install is by adding a new ppa in the system before you install the certbot. certbot provides various certificate related functions, here we just want to request server certificate from the Let’s Encrypt CA, the certonly command is all that we need. We use the built-in web server from certbot, so the --standalone parameter is necessary. Otherwise you can also --webroot to make use of an already running web server instance. by default, all the generated keys and certificates can be found in /etc/letsencrypt/live/$domain . If you take a closer look into this folder, you will find there are no physcial files, there are just symbol links to files (always the latest version) in /etc/letsencrypt/archieve/ and /etc/letsencrypt/keys . The valid period of letsencrypt certificate is relative short, certbot has a automatic mechanism to renew the certificates. These symbol links make the management of certificate easier. Here we use EMQ 2.3.3 as example. The dashboard of EMQ is implemented as a plugin. The default https dashboard is not enabled, we need to enable it by modifying its conf file. The config file of dashboard is emqttd_install_location/etc/plugins/emq_dashboard.conf if you installed it by unzip a zip package or /etc/eqmttd/plugins/emq_dashboard.conf if you used an installation package. 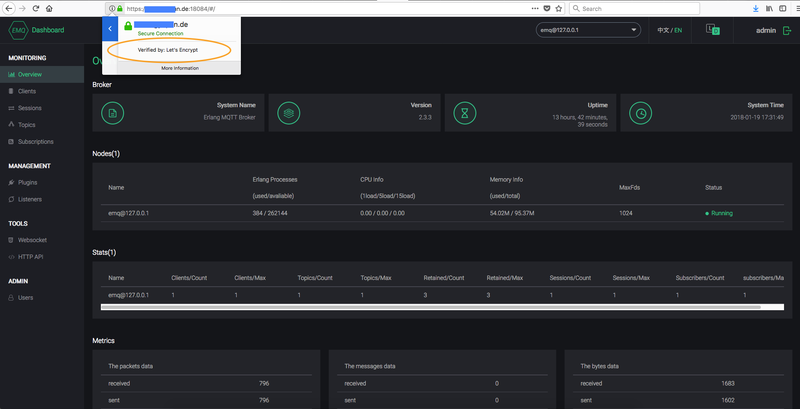 After doing this modification we can now restart the EMQ and try connect to the dashboard using https protocol. After that, you can see the nice green lock in your browser, it is verified by Let’s Encrypt. In the previous article we’ve talked about enabling MQTT/SSL using self signed certificate. On the EMQ side, this time we will do almost the same, only difference is that we will use Let’s Encrypt issued certificates this time. This time we are still going to use the mosquitto client to verify the SSL connection. I guess that you still remember in previous article we passed a --cafile parameter to the mosquitto client to enable the SSL, the cafile is the certificate of issuer of the domain certificate. To verify the domain certificate, the mosquitto client need to have all the intermediate certificates and the certificate of Root CA. As mentioned above, the file chain.pem contains the intermediate certificates. But where is the certificate of Root CA? The domain certificate is issued by intermediate “Let’s Encrypt Authority X3”, this intermediate is cross-signed by “DST Root CA X3” (from IdenTrust). IdenTrust is widely trusted by most OSes and applications, we will “DST Root CA X3” as root CA. You have good chance that you already have the ca certificate of “DST Root CA X3” if you run a not-too-old OS and a not-too-old OpenSSL or Browser. Taking Ubuntu 16.04 as example, check if this file exists: /etc/ssl/certs/DST_Root_CA_X3.pem . Combining these two files together, then we have the cafile to verify the domain ceritificate sent by EMQ. SSL Connection using the ca.pem .